As I mentioned before, I am a huge foodie, however, I’m defective. I have a series of food allergies that make dining a bit of an adventure, resulting in unique food combinations and ideas. I tend to lean into the challenges provided by my allergies, I think making great food without your “typical ingredients” is so satisfying. Giving someone a delicious treat that is good for them is the best! And so today we have one of my favorite (super easy) snacks: Kale Chips. I first had Kale Chips at this incredible restaurant in Boulder called The Kitchen [Next Door]. The food there is divine and their mind set of serving their community by using local goods from the community is fantastic (not to mention the design of the space is everything you would want your home to look and feel like). That first bite of Kale as a crisp, salty, savory snack was like taking the blinders off to reveal a whole new world of culinary possibilities. I had always known Kale to be a bitter leafy green that my mom forced me to eat as a child (cooked and mushy, worse than cooked spinach in my mind) but as I have grown and gotten more adventurous I figured, what the hell, it sounds good, it can’t be that bad, right? De-rib the kale, I know this sounds intimidating but its simple. Use the tip of your knife to outline the mane rib and your done. Cut the kale into 1.5 to 2 Inch pieces. Rinse throughly (you don’t want any critters being baked onto your treats). Use a colander to rinse the kale throughly and shake excess water off. Blott dry with paper towel, this is imperative, because if too much water remains on the kale it won’t crisp in the oven. 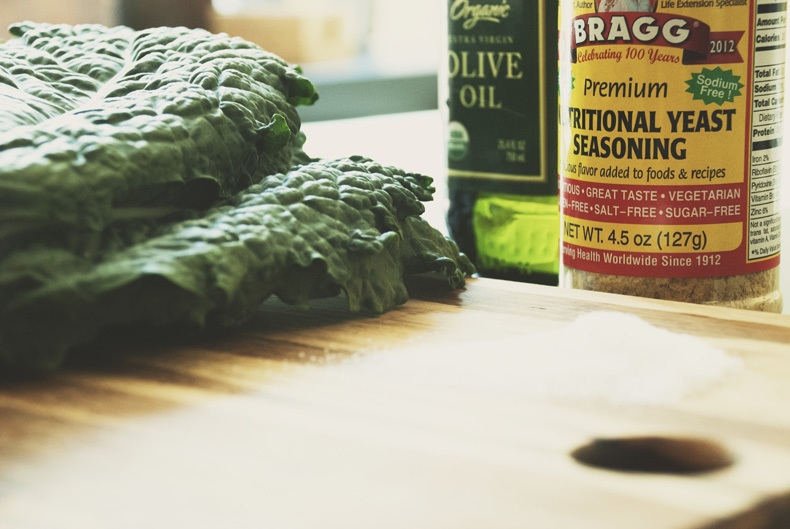 Spread Kale into a thin layer on the baking sheet and drizzle with remaining oil and sprinkle with Sea Salt. Bake at 275 for 20 minutes making sure to flip the kale half way through so it crisps evenly. Once crisped sprinkle with the Nutritional Yeast Flakes and devour! Kale is antioxident, full of vitamins such as K, A, and C. It is low calorie, high fiber and high in iron. It is also anti inflammatory. A great as a detox food. Nutritional Yeast Flakes are so incredibly good for you. It is one of the only non-animal source of B-12, and is rich in folic and amino acids. In fact 1 tbsp provides the full daily amount of B-12 needed for an adult.